Information about all participating artists and events in Lowertown during the Art Crawl can be found at www.saintpaulartcrawl.org. Visit these participating artists at Lowertown Lofts Artist Cooperative during the Saint Paul Art Crawl! In addition to these participating artists, a drawing by Jaci Gran is on view on the Third Floor. In addition to these participating artists, works by Tom Abel and Justin Terlecki are on view on the Fourth Floor. In addition to Gaylord, works by Beth Barron, Gina Dabrowski, Teresa De la Mora Rey, Tom Helmberger, Joe Krumpelmann and Tara Tieso are on view on the Fifth Floor. 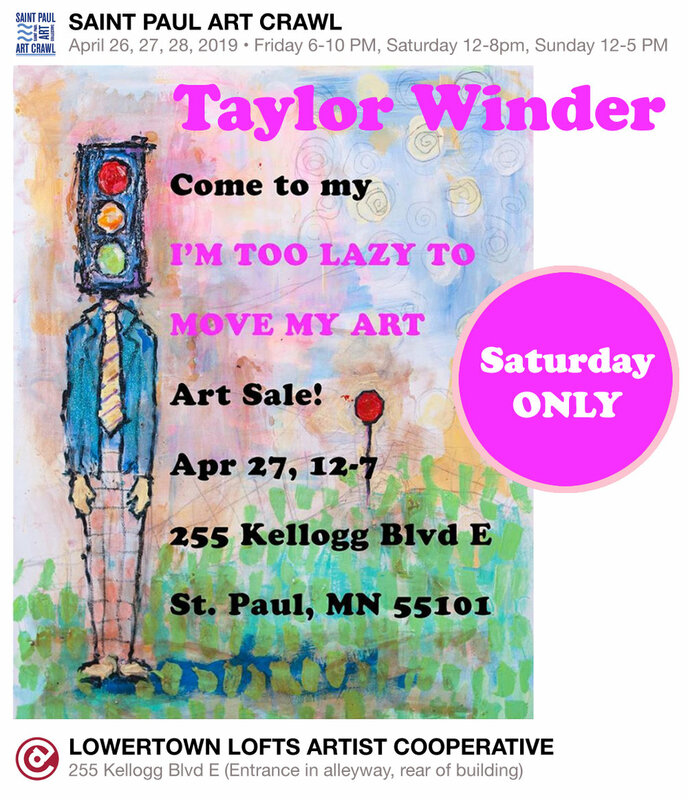 Beloved Co-op member/owner Taylor Winder is moving to Wisconsin and he’s having a Popup Art Sale during his last Art Crawl for one day only! Stop by his studio on the third floor throughout Saturday during the Crawl and wish him well and buy some great artwork and art books so he doesn’t have to move them. For more details on other artists and events happening at Lowertown Lofts Artist Cooperative, check out our blog. Join Co-op member/owner Justin Terlecki at the opening of his exhibition Chain of Lakes at the Groveland Gallery in Minneapolis. The artist will be present at the opening reception Saturday, April 27 from 2-5 pm. The opening reception and exhibition runs concurrently with The Hill That Walked Away by Dan & Lee Ross. Both shows continue through June 1, 2019. 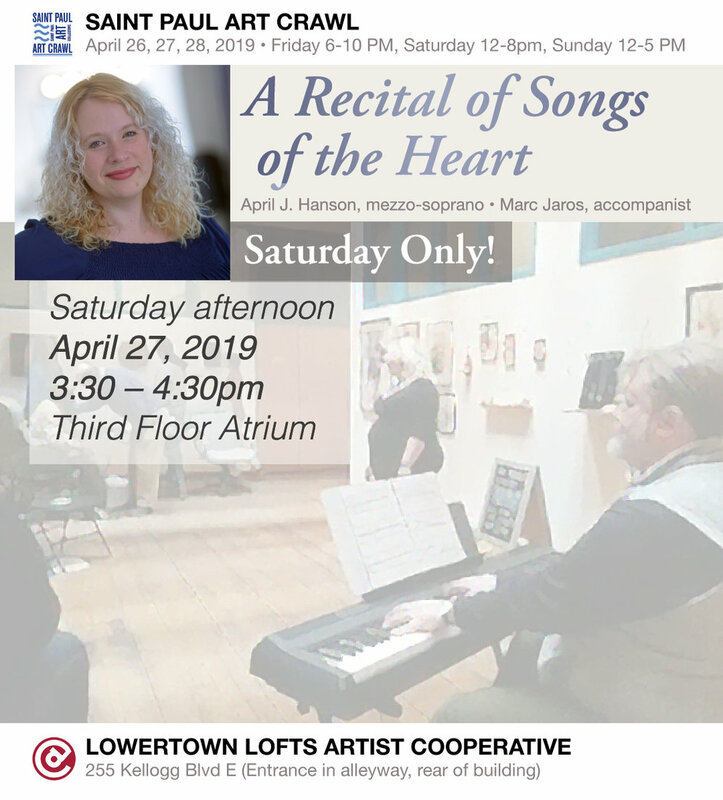 Saturday afternoon at 3:30pm during the Crawl, come and listen to Co-op members April J. Hanson (mezzo-soprano) and Marc Jaros (accompanist) for a special recital Songs of the Heart on the third floor of our building. For details on other artists and events during the Art Crawl at Lowertown Lofts Artist Cooperative, check out our blog. All floors of the Lowertown Lofts Artist Cooperative will be open during the Saint Paul Art Crawl in October. An informal tour of LLAC member/owner Gaylord Schanilec’s exhibition at the James Watrous Gallery in Madison, Gaylord Schanilec: A Natural History, with exhibition curator Jody Clowes. Co-op member/owner Gaylord Schanilec is internationally known for his color wood engravings, letterpress printing, and handmade books. Gaylord has often focused his attention on the wildlife, landscape, and culture of the upper Mississippi. This solo exhibition at the James Watrous Gallery in Madison (WI) features his four fine-press books focused on natural history—My Mighty Journey, by John Coy (2019), Lac des Pleurs (2015), Sylvae (2007), and Mayflies of the Driftless Region (2005)—along with framed color wood engravings from each book and a wide selection of working materials. Next concert on Friday, April 28, 8pm. NORA BUSCHMANN. MSCM CLASSICAL GUITAR QUARTET. Season 2016/17 Come early to reserve a seat and look at art. Come join us for a last hooray! The Lowertown Lofts Artist Cooperative is happy to participate in the Spring Art Crawl this month. (come early to look at art and chat with Lowertownsmen and -women). Enjoy the special atmosphere, great company and musical excellence that has made this series a go-to for music lovers in the Twin-Cities! ith complementary wine tasting by our generous friends from Lowertown Revival Wine, Beer and Spirits. Visit us at the St. Paul Art Crawl! The crawl poster winner, Lizzie Wortham, lives in and will be showing her work in our building. History: In 1991, the St. Paul Art Collective (SPAC) decided to coordinate a multiple building, weekend long, open studio event, and the Saint Paul Art Crawl was born. The five buildings that participated in the first Saint Paul Art Crawl were the Jax, 262 Studios,Lowertown Lofts Artist Cooperative, the Tilsner Artists’ Cooperative, and the Northern Warehouse Artists’ Cooperative. Due in part to the work of the Saint Paul Art Collective, all five buildings still house artist studios and participate in the biannual Art Crawl. Come to Lowertown on Friday, November 11 at 8pm to join us for a night of mixed chamber music by some of the finest local performers. Duo Ramirez/Haas (Flute/Violin) will perform works by Bartok, C.P.Bach and Henryk Wieniawski. Duo Andrea Stern/ Barbara Leibundguth (Harp/ Flute) will perform a set of Celtic music. Guitarist Eva Beneke will perform works by Beneke and more. In 1991, the St. Paul Art Collective (SPAC) decided to coordinate a multiple building, weekend long, open studio event, and the Saint Paul Art Crawl was born. The five buildings that participated in the first Saint Paul Art Crawl were the Jax, 262 Studios,Lowertown Lofts Artist Cooperative, the Tilsner Artists’ Cooperative, and the Northern Warehouse Artists’ Cooperative. Due in part to the work of the Saint Paul Art Collective, all five buildings still house artist studios and participate in the biannual Art Crawl, this year, the 25th anniversary. Join us for the opening of WARM Spring 3 - The third annual WARM new member pop-up show in the heart of Lowertown at Lowertown Lofts Artist's Cooperative. Make the eclectic painting, drawing, photography, assemblage, linocuts and social commentary of WARM's newest members a stop on your First Friday! Cover Image "Becoming Invisible" by A K D.
In 1991, the St. Paul Art Collective (SPAC) decided to coordinate a multiple building, weekend long, open studio event, and the Saint Paul Art Crawl was born. The five buildings that participated in the first Saint Paul Art Crawl were the Jax, 262 Studios, Lowertown Lofts Artist Cooperative, the Tilsner Artists’ Cooperative, and the Northern Warehouse Artists’ Cooperative. Due in part to the work of the Saint Paul Art Collective, all five buildings still house artist studios and participate in the biannual Art Crawl, this year, the 25th anniversary. Presenting the most beloved musical of all time in a new production, featuring a superb group of performers telling this story like it's never been told before! See Liz Carlson´s BIRD BITS 2015 - the 365 miniature birds - one per day - that Liz painted last year. Come early and enjoy the opening, save a seat and stay for the concert! The first concert in 2016 marks the collaboration of the four performers of OboeBass! and Duo Ancora as OboeBassFluteGuitar! For this concert they will perform several pieces as a quartet, and mix and match their instrumental combinations in a variety of genres from baroque to tango to jazz. Carrie Vecchione, oboe, and Rolf Erdahl, double bass created and perform in OboeBass! , the world's only professional oboe/bass duo. Catherine Ramirez is flute professor at St. Olaf College and internationally known soloist and teacher of flute. A native of East Berlin, guitarist and Lowertown Classics founder Eva Beneke performs, records, and teaches around the world in addition to serving on the guitar faculty at McNally Smith College of Music in St. Paul. *Enjoy the special atmosphere, great company and musical excellence that has made this series a go-to for music lovers in the Twin-Cities! * With complementary* wine tasting* by our generous friends from Lowertown Revival Wine, Beer and Spirits. Coffee and pastries generously served by Per.Ke.Lat coffee shop. Music, Art, Wine and Candy. CDs of the artists for sale. Bring a friend, and see you then! In 2015 I set out to complete my first one-a-day series of miniature watercolor paintings. AND I did it! 365 paintings! Come join me and see the compltete series displayed together at the Lowertown Lofts Artists Cooportive. Birds have been a long time theme in my art. I'm happy to have shared my intrest in them. I have learned about many new birds and attempted to render their likeness and personalities. All non-reserved Bird Bits will be available for purchase. ART VIEWING from 6-8pm, light refreshments will be served. In collaboration with my neighbor and amazing musician, Eva Beneke, we welcome you to the Lowertown Classics Series. Eva created and hosts this special series of classical concerts that take place at the Lowertown Lofts Artists Cooportive. The concerts last approximately 90 minutes with intermission and reception. She has corrdinated with with her fellow musicians to warm up the air with spring sounds. Think birds, spring and sun! This is sure to be an evening of art and music that warm you through the rest of the season! You are invited to an exclusive evening of art and television! On January 14th, 2016, a premiere screening of the MN Original Series featuring collage artist, Kristi Abbott, will be hosted at the Lowertown Lofts Artist Cooperative. Filmed late in 2015 over 3 days, the episode highlights Kristi’s unique artform, her technique and her artistic journey to date. On display will be work filmed during the TV show, as well as new commission pieces for local businesses A=RT (Art Equals Real Transformation) and the Minnesota RollerGirls. Please join us for wine and cheese and help us celebrate this exciting event. It´s December! The holidays are near, and we will celebrate the 15th Lowertown Classics - with you! Come early to look at art and save your seat on December 4th, 8pm. MUSIC by BACH, SCARLATTI, SOR, GRANADOS, RODRIGO, GIULIANI and Duo IMPROVISATIONS. As always, the Lowertown Lofts Artist Cooperative has invited exceptional local and international performers. With complementary wine tasting by our generous friends from Revival Wine Beer and Spirits. Music, Art, Wine and Candy...we´ll celebrate the season together! CDs of the artists for sale - they make great stocking stuffers. At the Black Dog Café in Lowertown, St. Paul. Visit us at the Fall Art Crawl. Stop back for more information as the date approaches. Reception: May 15, 6 – 7:30 p.m. Hours: M – F, 9 a.m. – 7 p.m.; Sat. & Sun. 11 a.m. – 5 p.m. THROUGHOUT THE MONTH OF MAY! Women’s Art Resources Minnesota (WARM) - Where women artists connect, learn and thrive. WARM was started over 40 years ago as a feminist arts collective, and quickly became known nationally for its artists, the social commentary of their work, their vision, and their commitment to the power of women’s art. Today WARM carries on this legacy by promoting women’s art in all its forms, supporting women’s rights, and building a strong presence and a powerful, prosperous future for women artists everywhere. Join WARM - Let your art make a difference. Visit our building during the Art Crawl and see the work of our amazing artists! Many studios will be open and the atrium will be full of our recent work. and Maja Radovanlija & Eva Beneke guitar duo. Two Russian pieces by Konstantin Vassiliev. Enjoy the special atmosphere, great company and musical excellence that has made this series a go-to for music lovers in the twin cities! With complementary wine tasting, coffee and pastries by our generous friends from Lowertown businesses Perkelat and Revival Wine, Beer and Spirits! Feel free to ring a friend and join us for a great nigh out in Lowertown! Enjoy the special atmosphere, great company and musical excellence that has made this series a go-to for music lovers in the twin cities! For the 10th show, we have some special surprises for you in store....one of which is wine tasting, coffee and pastries by our generous friends from Lowertown businesses Perkelat and Revival Wine, Beer and Spirits! The rest you'll have to find out in person. Bring a friend and join us for a great night in Lowertown! Venezuelan cellist Tulio Rondón plays a Suite by Bach. Duo OboeBass! - back by popular demand, the world´s only oboe/bass duo performs music by Goplerud, Mann, Julie Johnson and Eric Hansen. with Carrie Vecchione - oboe, and Rolf Erdahl on bass. Choro Borealis - this exciting trio will warm your hearts with Choro-music from Brazil! Robert Everest on 7-string guitar, cavaquinho (a steel-string cousin of the ukulele), and occasionally vocals and percussion; Pat O'Keefe on Bb Clarinet, bass clarinet, and percussion; and Tim O'Keefe on mandolin, cavaquinho, and percussion. The magic of the group is in the playful rotation of instruments. For one number Tim and Pat take turns on the melody and solos while Robert plays bass-lines on the low strings. On the next tune Robert might play the cavaquinho and sing in fluent Portuguese while Tim plays percussion and Pat covers the lower range on bass clarinet. All three also compose and arrange music in their repertoire, which includes many Choro favorites easily recognized by any Brazilian or Brazilian music connoisseur. One thing that makes this trio so engaging is the far-reaching musical endeavors and broad palettte of all three members, each with a unique musical background. Enjoy the special atmosphere, great company and musical excellence. With the successful combination of wine, candy and a promise of YOUR company, we were able to lure these two phenomenal artists to Lowertown! They will perform a witty, entertaining and musically compelling selection of songs and arias by Bach, Puccini, Kern, Wodehouse and more. Maria and Dan are bringing their latest CD "The Siren's Song" that has been featured on "A Prairie Home Companion". DON'T MISS THEM! Also on the program: "Letters from composers" - a song cycle for voice and guitar (Maria Jette with guitarist Eva Beneke) by the brillant DOMINICK ARGENTO, Minnesota based composer, Pulitzer-price winner and early founder of the Minnesota Opera. If you haven't heard these songs, you should come and be ready for a true treat of musical poetry and lyricism. OPEN HOUSE COMING UP! See the space, meet other coop artists, fall in love, apply! Why not go out, sit in the warm, listen to some stellar live classical music and have a glass of wine - all for $5 or so? "A triumph of energy and creativity!" Clarinet player Pat O´Keefe, a twin cities favorite, who will bring his newest solo CD "Contents may differ" and play Schubert´s beloved Arpeggione Sonata with guitarist Eva Beneke, who will also play some solo works she brought back from her december tour to Germany. Ladyslipper Ensemble - voice, guitar and bass. A musical extravaganza of classical, baroque and SWING music! Tell your friends, and join us for a special night out on the town here in Lowertown St. Paul. On the program: the world's ONLY OBOE/BASS DUO, Duo Ancora (flute /guitar) and RANDY SABIEN's SWING Quartett NOUVEA GROOVEAU, featuring McNallySmith talents and bassist Gary Raynor, who you have heard week after week on 'A Prairie Home Companion'! Join us for the St. Paul Art Crawl! Lots of open studios and guest artists.